i just setup a new printer, first time Repetier to try the features. Everything went smooth so far accept one weird problem. I tried PID Autotune to 200°C but it turns of after 1-2 tries with a Errormessage "Hotend to Hot"
Temperature too hot means you exceeded the allowed max. temperature from configuratuin.h. You can increase that or run M303 at lower temp. e.g. 180. What I wonder is your limit of PID Max to 128. If you use 24V on 12V elements the limit is 64. Power = I^2 * R and I = U/R so voltage influence is squared! 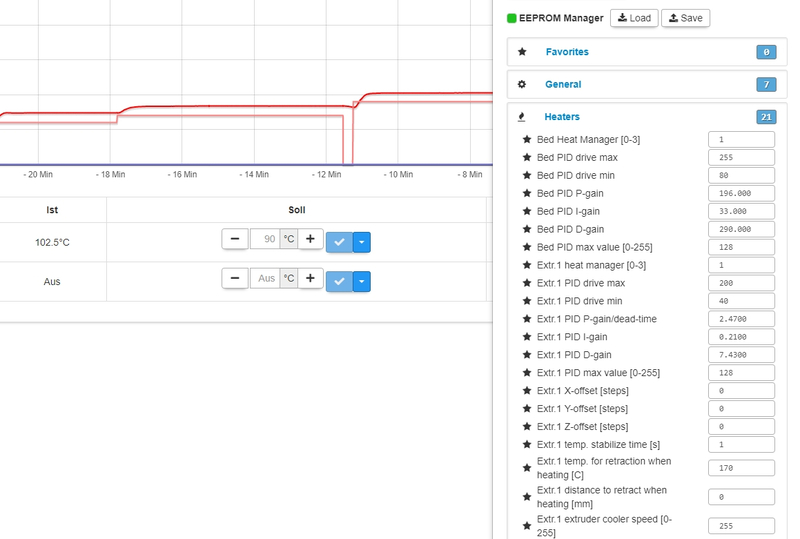 Would be helpful here to also see output over time in graph to see what firmware is doing here. I think your drive min of 40 is too much in your case. That is for heaters that go to 255. Yours is maybe 10.